Whether you like it or not, the holiday season is approaching. To prepare our team is working on several gift guides and searching for entertaining and recipe ideas for the upcoming season. 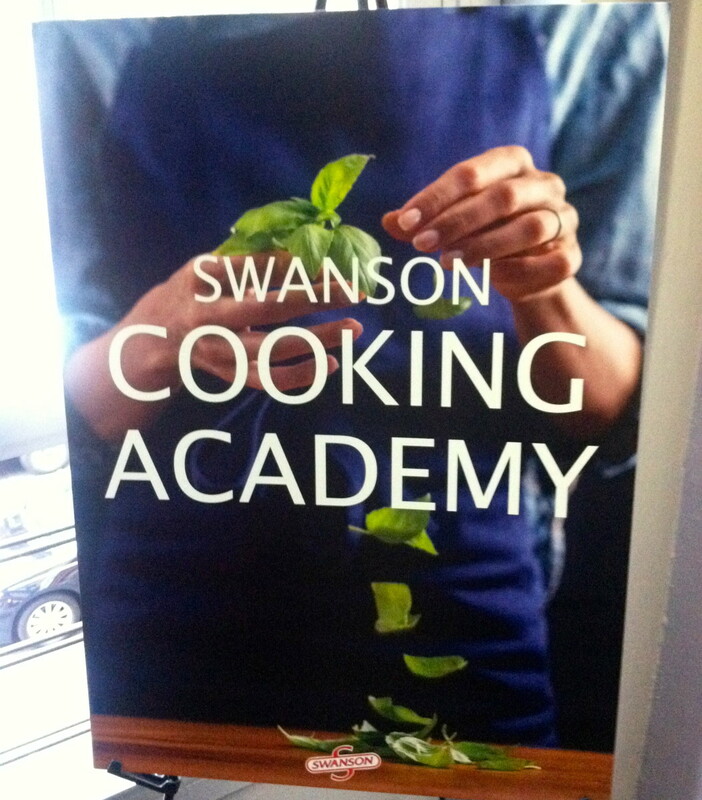 During a recent event with Swanson Broth, I learned some new ways to cook with their broth as well as learn more about how to cook with their new line of flavor-infused broth. 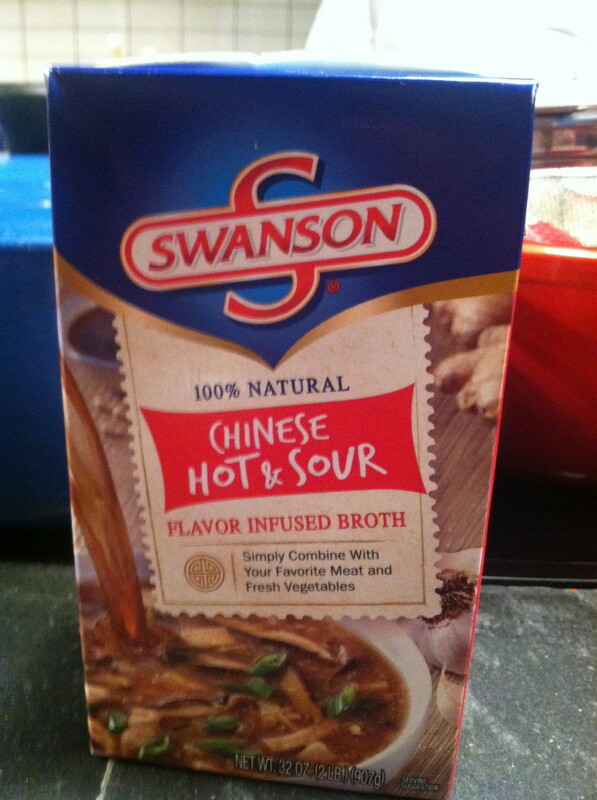 Starting with the new line of flavor-infused broths, I had the chance to taste the three new varieties including the Swanson Mexican Tortilla Flavor Infused Broth, Swanson Thai Ginger Flavor Infused Broth and the Swanson Chinese Hot & Sour Soup Flavor Infused Broth. Created to enhance food with unique flavors, these flavor-infused broths are a great way to enjoy meals without having to locate hard-to-fin ingredients. This is also a time-saver for parents who want to have a diverse menu at home but are crunched for time. 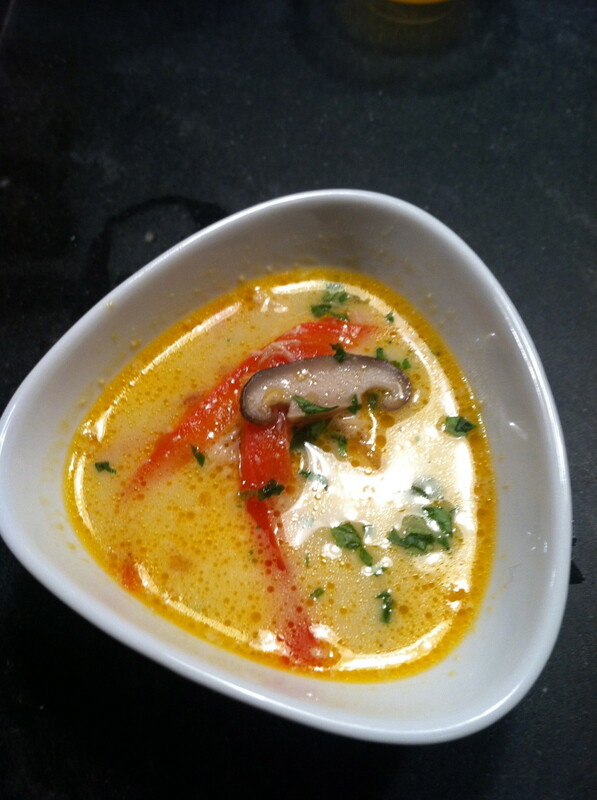 During the event, Chef Christopher Tanner made unique recipes using these broths such as a Mushrooms with Mole Amarillo using the Swanson Mexican Tortilla Flavor Infused Broth and a Thai Coconut soup using the Swanson Thai Ginger Flavor Infused Broth. I really loved how the flavors enhanced the meals without using complex ingredients. The flavors were rich and layered - making them ideal for entertaining and quick meals at home. 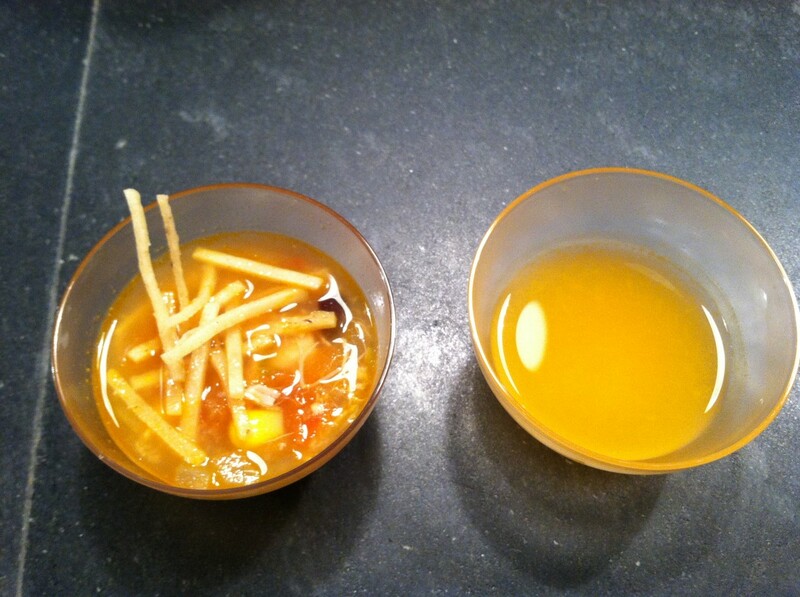 For the holidays, Chef Christopher Tanner gave us some amazing food ideas where he used the various broths such as Swanson Chicken Broth, Cooking Stock, and Limited-Edition Turkey Stock to make some memorable meals for the holidays. This included ways to make mashed potatoes, Brussel sprouts with Chestnuts, and a delicious Pumpkin Soup (recipes below). 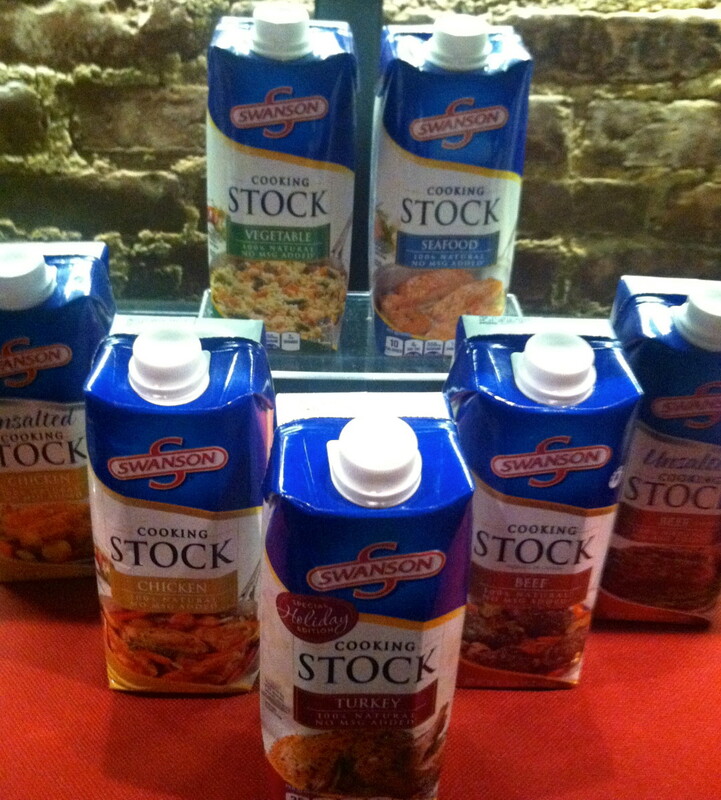 With the holidays coming it was great to learn some ways to enhance my meals in such an easy way. I generally think of broth for soup but with Swanson, I know have a whole arensal of unique and tasty recipes to share with my family and friends. 1. Heat the broth and potatoes in a 3-quart saucepan over medium-high heat to a boil. 2. Reduce the heat to medium. Cover and cook for 10 minutes or until the potatoes are tender. Drain the potatoes well in a colander, reserving the broth. 3. 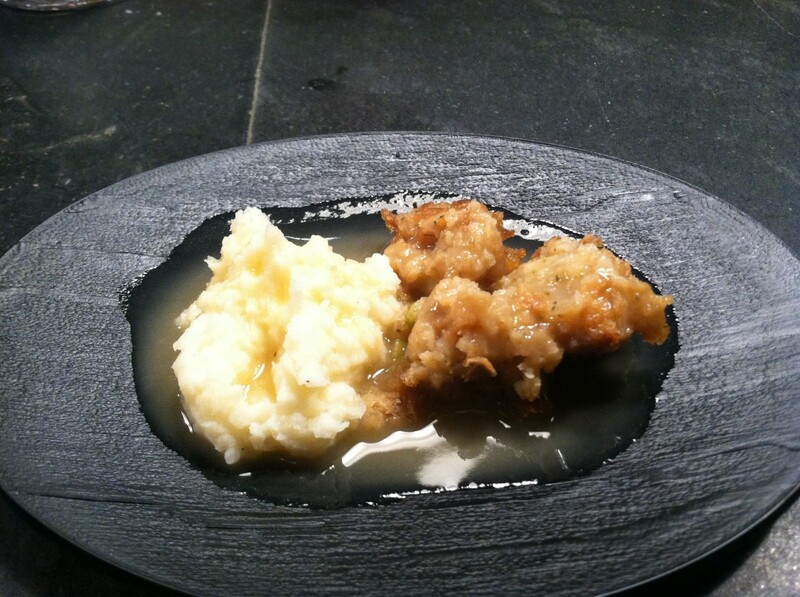 Mash the potatoes with 1/4 cup reserved broth, the cream, butter and black pepper. Add additional reserved broth, if needed, until desired consistency. Flavor Variation: For Ultimate Mashed Potatoes, stir 1/2 cup sour cream, 3 slices bacon, cooked and crumbled (reserve some to sprinkle on top), and 1/4 cup chopped fresh chives into the hot mashed potatoes. Sprinkle with the reserved bacon. Easy Substitution: For Ultra Creamy Sweet Potatoes, substitute 2 large sweet potatoes (about 2 pounds), peeled and cut into 1-inch pieces (about 5 1/2 cups) for the potatoes. Makes 5 servings. Serving Suggestion: These potatoes are delicious served with your favorite Campbell&apos;s® Gravy. 1. Heat broth, black pepper, celery and onion in 3-qt. saucepan over medium-high heat to a boil. Reduce heat to low. Cover and cook 5 min. or until vegetables are tender. Add stuffing and mix lightly. 2. Spoon stuffing mixture into greased 3-qt. shallow baking dish. Cover baking dish. 3. Bake at 350°F. 30 min. or until stuffing mixture is hot. You can also use a 3-qt. casserole for this recipe. For crunchier stuffing, bake stuffing uncovered. For Cranberry & Pecan Stuffing, stir 1/2 cup each dried cranberries and chopped pecans into stuffing mixture before baking. For Sausage & Mushroom Stuffing, add 1 cup sliced mushrooms to vegetables during cooking. Stir 1/2 lb. pork sausage, cooked and crumbled, into stuffing mixture before baking. Serve with store-bought rotisserie chicken or turkey breast and steamed whole green beans. Serve key lime pie for dessert. Heat the butter and oil in a 6-quart saucepot over medium heat. 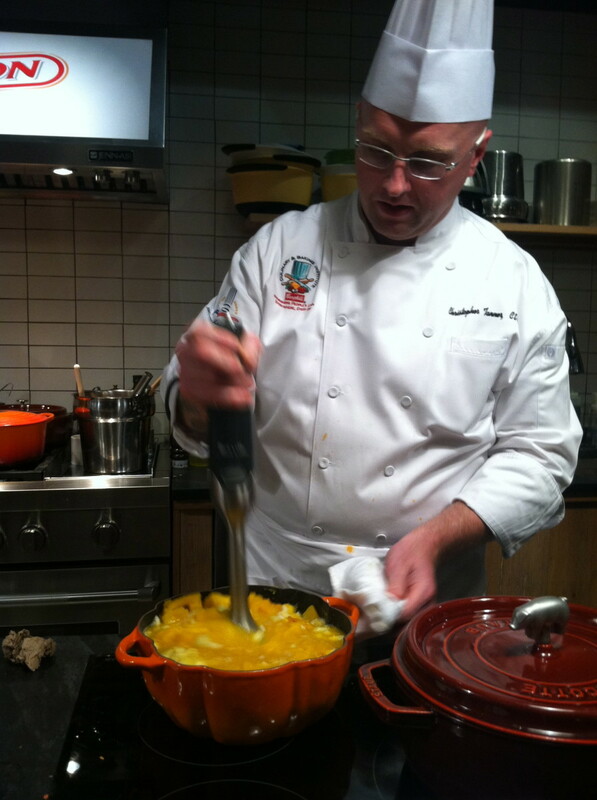 Add the pumpkin, apples, onion, sage, salt and black pepper and cook until vegetables are almost tender. Stir the broth in the saucepot. Heat to a boil. Reduce the heat to low and cook for 10 minutes or until the pumpkin is tender. 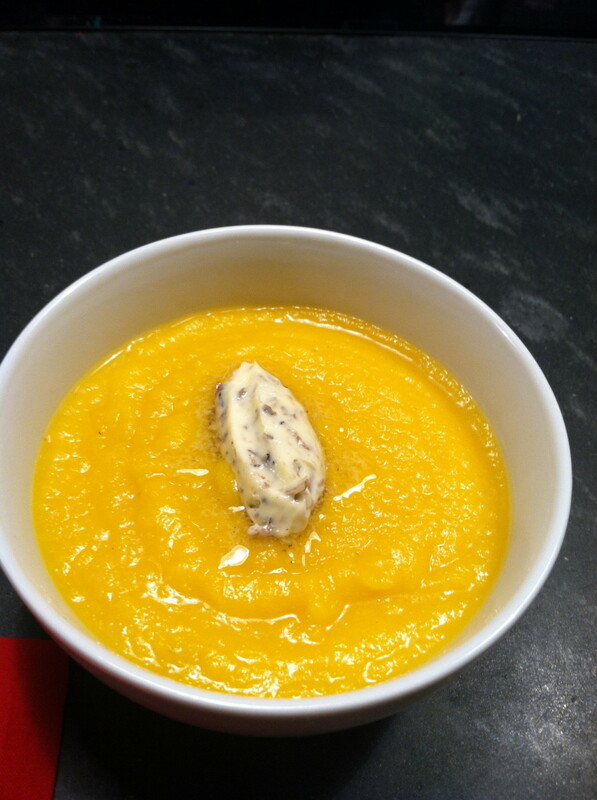 Using a blender, puree the squash mixture. Serve. Bring a large pot of water to a boil. Use a paring knife or a chestnut knife to cut a large X into the shell of each chestnut on one side. Drop chestnuts a handful at a time into the boiling water, boil for 5 minutes, and remove from water. 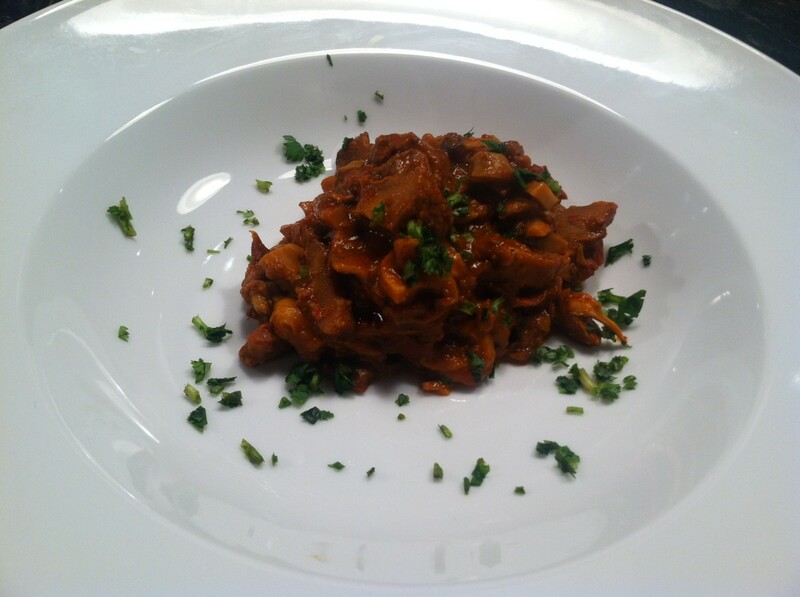 Immediately remove and discard shells, keeping chestnuts whole if possible. Set peeled chestnuts aside. Heat a large sauté pan over medium-high heat, add bacon and cook until crispy. Remove bacon from pan leaving the rendered fat in pan. 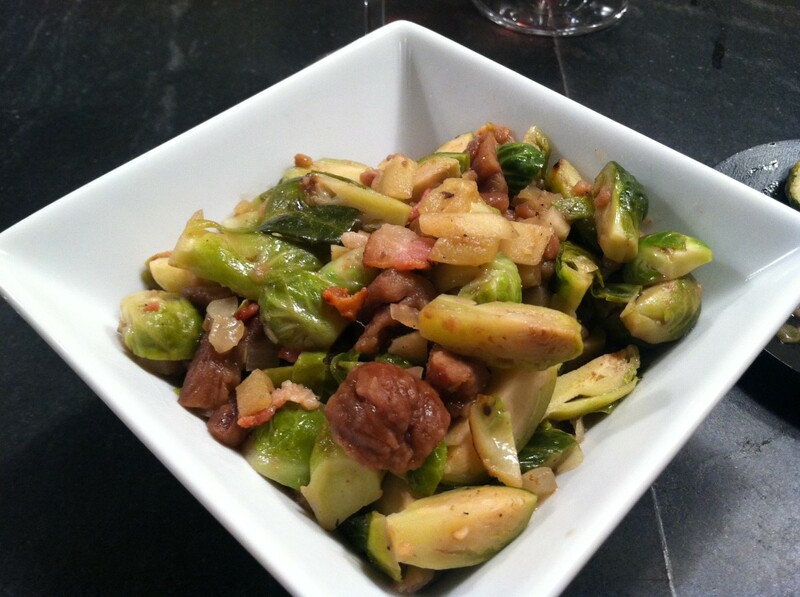 Add Brussels sprouts; season with pepper, cook stirring occasionally until golden, about 10-12 minutes. Add the onions and apples; continue to sauté for an additional 4-5 minutes or until apples begin to soften. Add chestnuts, stock, and sugar, cover and simmer for 20 to 25 minutes or until chestnuts are tender. Remove cover from pan, cook, stirring occasionally, until liquid has been reduced about 4 to 5 minutes. Transfer to a serving dish, top with rendered bacon and serve.